Is the house edge in different roulette games (e.g. European/American/French) the same? How is house edge worked out? In this article I'm going to answer those questions and cover everything you could possibly want to know about house edge (or "house advantage") in roulette. These house edges apply to any bet you can make at the roulette table for each game variant. Note: The only bet that has a different house edge is the Five Number Bet in American roulette (0, 00, 1, 2 and 3). The house edge for that bet is 7.89%, which is largest in these standard roulette variants. Out of the three most common variants of casino roulette that can be found online, American roulette has twice the house edge of its European and French cousins. So as you can guess, if you have the option of playing on either an American or European roulette table, it's always better to play on the European table -- that's if you're interested in improving your chances of winning, of course. The extra 00 is the reason why the house edge in American roulette is larger than in European or French roulette (they do not have the 00). It's also quite possibly the reason why new born babies cry. 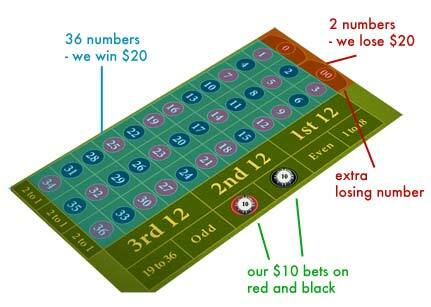 Selecting European over American roulette is one of the most fundamental tips for playing roulette. Why the difference in house edge between American and European roulette? Because American roulette has an additional "00" number, whereas European (and French) roulette do not. The payouts for each bet in both American and European roulette are exactly the same, so the extra 00 number just provides another opportunity for you to lose money in American roulette. Let's say that you place $10 on red and $10 on black, for a total bet of $20. It's a bit of a pointless bet I know, but bear with me! In European roulette there are 36 red and black numbers combined, with only one green 0 number. Therefore, you will win your $20 back 36/37 times when the result is red or black, and only lose your entire $20 bet 1/37 times when the ball lands on the green 0. European roulette has one green number that could cause us to lose our $20 bet. In American roulette however, there is an additional green 00 number. There are still 36 red and black numbers combined, but now there are two green numbers instead of one. As a result, you will lose that $20 bet 2/38 times. 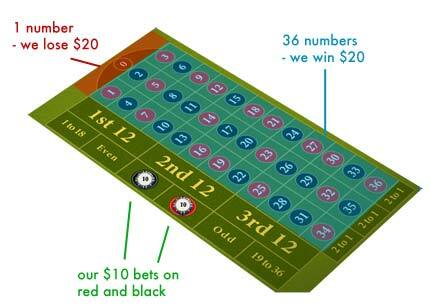 American roulette has two green numbers that could cause us to lose our $20 bet. The odds of losing your $20 bet are almost doubled in American roulette thanks to that extra 00 number. You should also notice that the house edge in American roulette (5.26%) is almost double that of European roulette (2.7%), which makes sense as these two odds and percentages are directly linked. So why do online casinos offer American roulette? Good question. If you have the choice of playing at either a European roulette table or an American roulette table, why would an online roulette casino bother offering the American version if it's essentially the same game but with worse odds? The answer: players that are not familiar with the differences in house edge will still play American roulette. If you didn't know about the bigger house edge in American roulette, you wouldn't have any reason not to play it. So if people are still going to play the game, it makes sense for the online casinos to offer it and take advantage of the extra money that these players will inevitably lose. I guess the only other reasons would be to cater to those that are feeling especially lucky, or to US citizens that are far too patriotic to play European roulette. What does the house edge % mean? It's all well and good knowing that one game has a 2.7% house edge, whereas another has 5.26%, but what does this mean for you as a roulette player? The answer: the percentage represents the portion of your bet that you are going to lose to the house on average with each spin of the wheel. For example, if you make a $10 bet on one spin of a European roulette wheel, over the long run you will be losing 2.7% of that ($0.27) to the house. Now, of course you're not going to lose $0.27 exactly; you're either going to lose the entire $10 or see a return of something like $20 if your bet comes in. The point is that this is the imaginary amount of money that this bet is costing you on average over the long run thanks to the house edge. So if you ended up betting $100,000 on roulette over a certain period of time, you could expect to lose roughly $2,700 on average, assuming that you were playing on a European or French table with a house edge of 2.7%. If you played American roulette on the other hand, you could expect to lose around $5,260. Roulette house edge compared to other casino games. The house edges for different casino games will vary depending on how you play or what kind of bet you place (roulette is actually one of the few games where the house edge is almost always the same for each bet). Note: The table above highlights the lowest possible house edge if you play perfectly or place bets with the lowest house edge in each game. Compared to other popular casino games, the house edge in roulette is relatively high. However, in my opinion that's a fair trade off considering it's the most entertaining and exciting game in the casino. If you only care about improving your odds of winning, you're better off playing Blackjack or Baccarat. How to work out house edge in roulette. To work out the house edge of a bet in a casino game, you need to work out the expectation of that bet. "Expectation" is basically a mathematical term that means "how much you're going to win or lose in the long run". The probability of winning, and the amount that you win when you do. The probability of losing, and the amount that you lose when you do. This is pretty straightforward in roulette, and as always the best way to show you how to work out expectation is through an example. Working out roulette expectation example. Let's say that we bet $100 on red on a European roulette table. When we win, we win $100. When we lose, we lose $100. That's easy enough. All we need to know now is the probabilities of losing and winning with this bet. To work this out, we just look at the total number of outcomes and split them in to winning outcomes and losing outcomes. So we've got a win/loss amounts and their probabilities. All we've got to do now is stick them in our expectation equation. On average, this $100 nets us a loss of $2.70. Surprise, surprise, $2.70 is 2.7% of $100, which is equal to the house edge in the game of European roulette. Fact: If there were no green numbers (i.e. 0 or 00) and the payouts remained the same, there would be no house edge in any of the roulette games. You can try this equation with any bet in European roulette and you will find that your average net loss is 2.7% of your total bet (or 5.26% if you work out your expectation on an American roulette table). Go ahead and try it with something like a straight bet (1/37) or a dozen bet (12/37) and see the house edge results for yourself.